Coat-of-Arms : Extract from "A Companion to Local History Research" , John Campbell-Kease, regarding feudal differencing of arms, plus miscellaneous notes about other families coats-of-arms which are similar in appearance to that of the Tonge family. I was recently came across the following passage in a book I was reading. I was particularly interested in it, firstly because of the similarity between the tincture described and that of the Tonge family, and secondly because of the similarity which I had previously noticed between that of the Tempest family of Bracewell, and the Tonge family. "The latest edition of Boutell's Heraldry gives a fine series of examples of feudal differencing of arms as assumed by the family of Luterell and their associated and dependent folk. 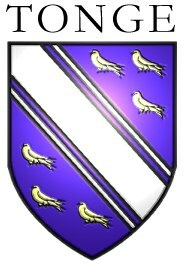 In formal terms the Lutterel arms may be described as or a bend between six martets sable - that is, a gold shield carrying a black diagonal band with, on each side of this, three birds rather like house martins. This design with colour variations and ornaments, was used by the de Furnival, Eccleshall, Wadsley, Wortley and Mounteney families. It illustrates a simple and straight forward situation , for the relationship between the Luterells and the feudal tenants is well documented. Unfortunately the local historian cannot rely on such proximation of tincture and style being always a sign of seignorial attachment. Different families are known to have employed quite similar arms to each other with apparent impunity (especially before the foundation of the College of Arms on 2 March 1484), and there is no evidence to suggest their actions where anything other than innocent." de Furnival. Thomas de Furnival, in St George's Roll, E208. Wortley. The coat of arms was granted to the Wortley family from Yorkshire, England. This family descended from Sir Thomas Wortley, of Wortley, representative of an ancient Yorkshire family. De la Bere. The arms are first recorded of Simon De la Bere in the St. George’s Roll of 1285, and similar arms were used by the the A'Bear family of Wargrave in Berkshire. Mollaines. European Rolls of Arms of the Thirteenth Century, Beauvaisis, Wijnbergen Roll.